Growing up, I thought Princess Leia was beautiful. I didn't know she could write. 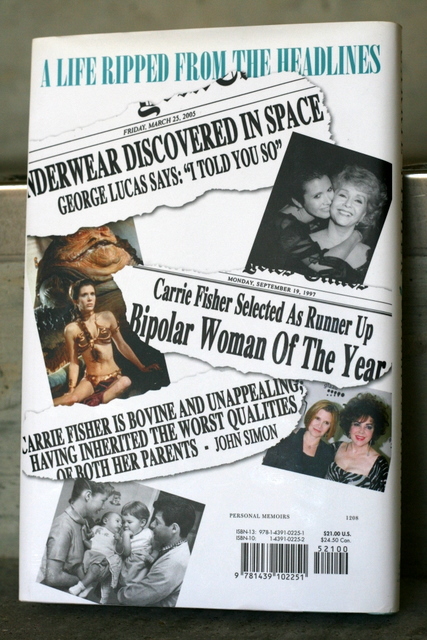 OK, well, it's Carrie Fisher who can - but really, she and Leia are indistinguishably fused as one and the same. 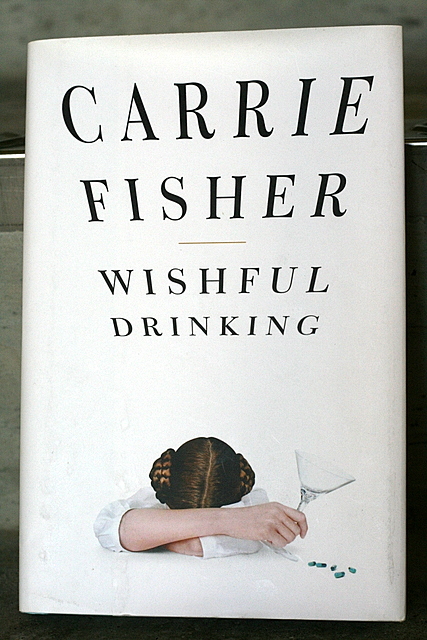 Her latest book, Wishful Drinking, wryly picks on that and many other details of her life. The book is also a one-woman show in the U.S., which is why it reads like she's on stage, talking to you. It's brief (only 156 pages) but wickedly brutal and hilarious. Fisher recollects her very strange Hollywood life, bent out of shape early by the very absent father who left her superstar mother for a newly widowed Elizabeth Taylor. Then there are the cliched parts - the bipolar disorder, drugs and drinking. She proudly tells you she's in the Abnormal Psychology textbook, complete with photo (guess which one?). But puzzling bits include a Republican who died in her bed (no, it's not what you're thinking - he was gay). Electro-convulsive shock therapy that makes Guantanamo Bay sound humane. And George Lucas insisting that she cannot wear a bra while filming Star Wars because...there is no underwear in space. Ludicrous? He actually expounds on the scientific reason (oh yes, there is). Did you also know she was married to Paul Simon? Once, anyway. They dated much longer than they were married, and dated again after divorce. Quite a few songs had lyrics about her. And then her second husband left her for a man. She deals out memories with jarring brutality, self-lacerating wit and eye-popping honesty. You do get the sense Fisher is not pretending to be important though. Some references I found a bit crass. Yet some parts are so delicate and touching, you really feel for her. Fortunately, there are some positive highlights that breathe hope - her daughter Billie who sounds precious. A New Hope, perhaps. What's life without it? I shall leave you with some classic scenes of Leia and Han.